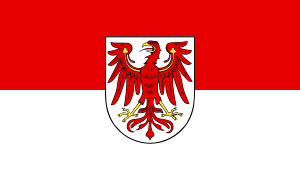 Today HOPE Cape Town is graced by the visit of a delegation from Brandenburg in Germany. 55 delegates will come and hear about our work, but also the work, the University of Stellenbosch is doing. More and more we discover how important it is to connect sciences and grass root and create a synergy which is beneficial for both sides. Prof Erasmus, Prof Wolfgang Preiser and myself will present this afternoon and the accompanying minister will then visit the Ithemba Ward. So for HOPE Cape Town an exciting start into the week. Other developments are also to be reported: We welcome our new two doctors and with Izane Reyneke we also have now a program coordinator on board to oversee all our working arms, assess and streamline them. We also bid farewell to Prof Bernd Rosenkranz, who resigned from the Board of the HOPE Cape Town Association and thank him for all his good work, support and advice. It is always sad to let people go, but there is, as Kohelet in the bible already said, a time for everything in life. During the Ball of HOPE Monika Rosenkranz as well as Ryan and Dennis presented each their donation result about the support projects they had run till now for HOPE Cape Town. Also here a word of thanks for the creation of wonderful trappings with the mummies for hope and the hard work of running for HOPE. As one can see, there are so many ideas how to support the good cause and there is no limit to creativity in doing so. Towards the end of the German-South African Year of Science, the then German Minister of Education and Research, Dr. Annette Schavan, and her delegation visited HOPE Cape Town on February 7, 2013. 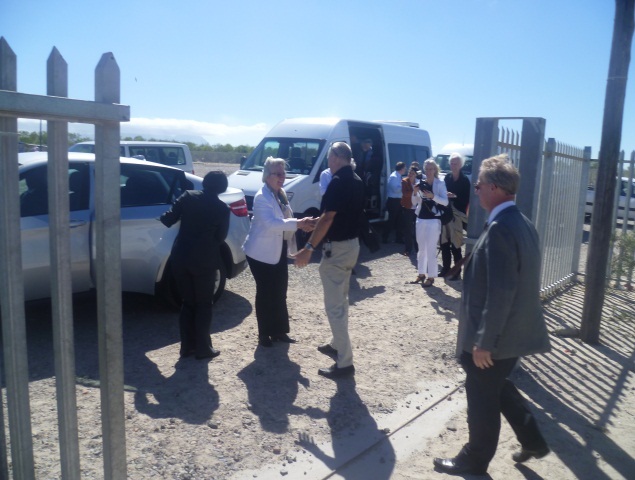 The German visitors were hosted at the Blikkiesdorp informal settlement where HOPE Cape Town runs an outreach programme that supports HIV-infected children and their families. During this visit the German delegation was also informed about the collaboration between the Pharmacology and Virology Divisions of the University of Stellenbosch and HOPE Cape Town. Just before 4 p.m., Rev. Fr. 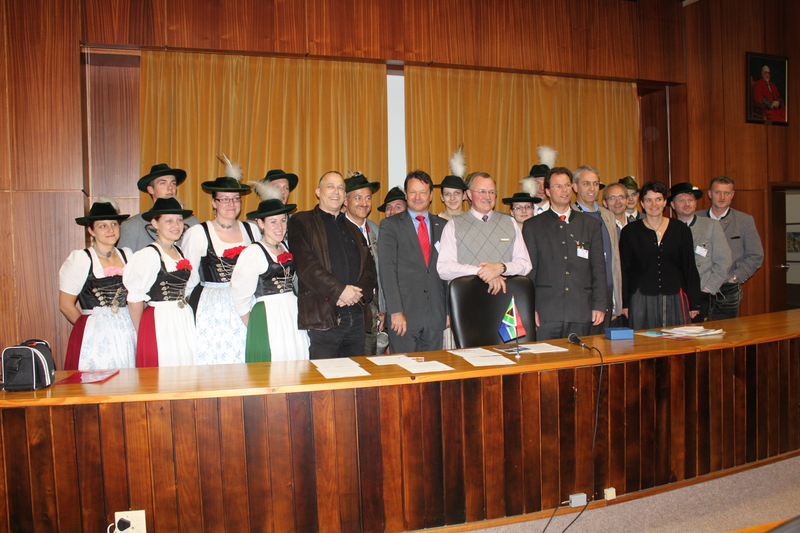 Stefan Hippler, employees of HOPE Cape Town and Professors Bernd Rosenkranz and Wolfgang Preiser from the University of Stellenbosch welcomed Dr Schavan and her delegation of about 30 people from the German parliament, academic and other institutions to Blikkiesdorp. Previously, the minister had attended meetings with local and international enterprises and organisations in South Africa in order to consolidate the scientific cooperation between both countries. Prof Dr Bernd Rosenkranz, Head of the Division of Pharmacology, and his colleague Prof Dr Wolfgang Preiser, Head of the Division of Medical Virology, both also HOPE Cape Town board members, shared their experiences of being part of a joint German-South African research project on infectious diseases with the group. One project that was presented described how German students had the opportunity to familiarize themselves with diseases common in South African that are rare in Germany. In return, the joint research project allowed South Africans to develop new forms of treatment that had been tested in Germany before. Rev. Fr. 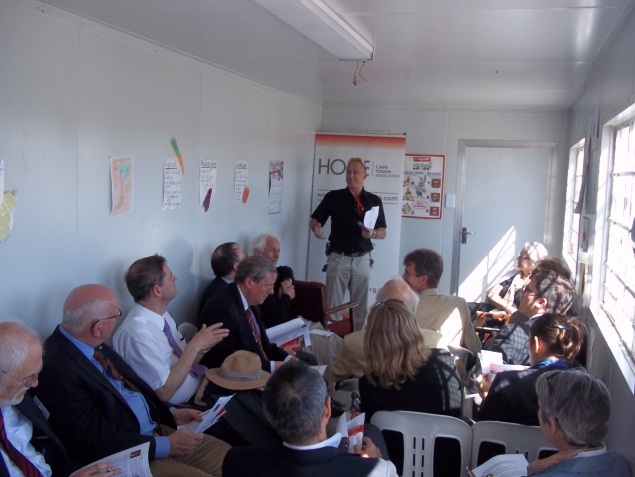 Hippler introduced the non-profit-organisation HOPE Cape Town to the audience. He highlighted the importance of the world-wide network of the charity and emphasised the significant contribution that the cooperation between international medical research initiatives and local communities brings about. Moreover, the catholic priest underlined how the work of HOPE Cape Town’s 30 employees at the Ithemba ward at Tygerberg Hospital and in 20 primary health care facilities in various informal settlements contributes to the fight against the HI virus. 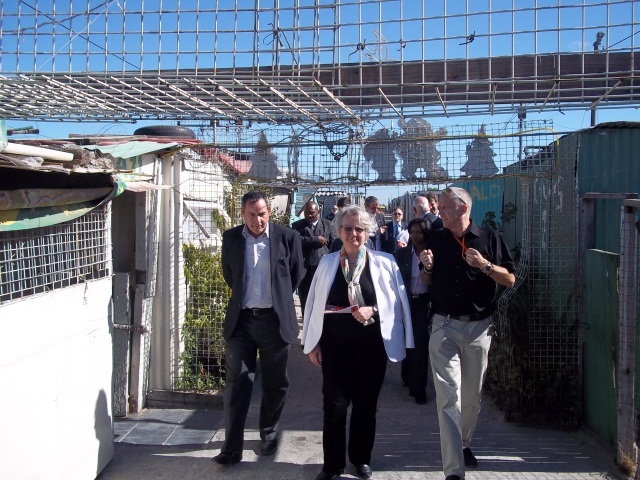 The visibly interested minister and her delegation from Germany were invited to walk through Blikkiesdorp and meet its inhabitants whilst Rev. Fr. Hippler and the HOPE Cape Town community health workers explained to the visitors under which difficult circumstances people live there. Furthermore, the delegation was informed about the severe social problems such as unemployment and domestic violence that mark people’s daily existence. Through visiting HOPE Cape Town’s project in Blikkiesdorp the foreign visitors were given an authentic albeit a little uncomfortable experience of the challenges that people living in informal settlements face on a daily basis. The German delegates enjoyed the hands-on experience as a welcome alternative to the usual power-point presentations that they have to sit through on such visits. 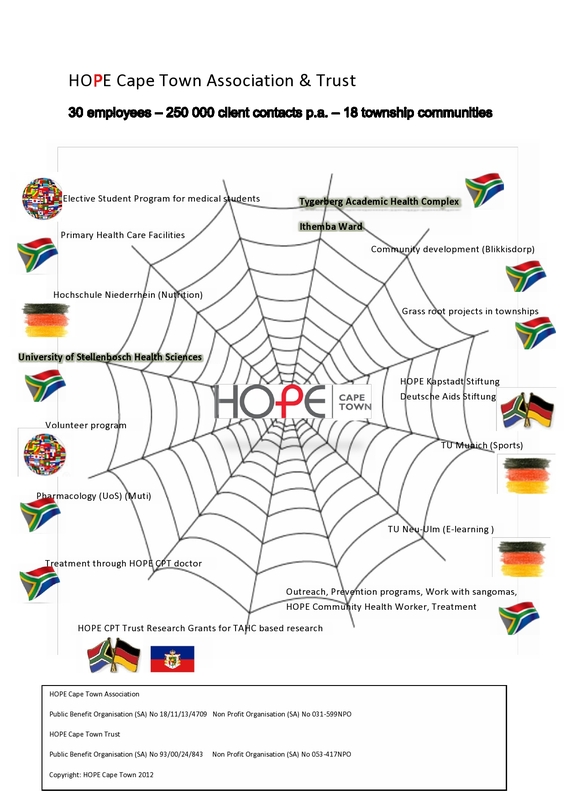 In the morning a workshop to HIV and sports – the framework for a cooperation between the Technical University in Munich – Sport sciences and the University of Stellenbosch, Health Sciencies and HOPE Cape Town is officially introduced at the Bavarian House. Three strong partners will join forced on the long term run to work in the fields of HIV and sports. In the later afternoon the Letter of Intent is signed by Prof. van der Merwe (University of Stellenbosch), Prof. Beckmann (TU Munich) and myself (for HOPE Cape Town).